Gates will continue as defense secretary. CHICAGO (CNN) - Several officials close to President-elect Barack Obama's transition told CNN on Tuesday that Defense Secretary Robert Gates is expected to stay on the job for at least the first year of the new administration, with one source calling it "all but a done deal" that the official nomination could be announced as early as next week. "It's now pointing in that direction," one of the sources close to the transition said of Gates being part of Obama's national security team, which many say also is likely to include Sen. Hillary Clinton as secretary of state. "It's likely to happen," a second source close to the transition said of Gates staying on. This source noted that Gates could stay longer than a year if he and Obama end up working well together. Sources close to the transition have said Obama is interested in some continuity at the Pentagon because he is entering office having to deal with two wars - in Iraq and Afghanistan - as well as the international financial crisis. The president-elect also has made no secret of his interest in having divergent views within his Cabinet. 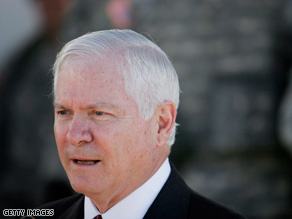 Gates has previously served in various national security roles under Republican presidents, including CIA director during former President George H.W. Bush's administration. Gates would be joining a high-profile national security team that is also expected to include a retired four-star general. Several sources close to the transition have told CNN that retired Marine Gen. Jim Jones is on track to become national security adviser within the White House. "Jim has the job if he wants it," said one of the sources close to the process. It seems Gates has did a good job so far. I'd rather see Chuck Hagel or Wes Clark fill this spot. Bush cronies will only make President Obama's job harder since they are adapted to serving an egotist ergo lacking in their own ideas and initiative. Perhaps this is merely a transition spot till we can evacuate Iraq and redeploy our forces. Gates is an intelligence expert not a military manager. Oh, Sec Def Gates, how can you help out this idiot Obama? Let him flop in the wind with all the wild promises he made. . . I think Gates is a wonderful person but – NOBAMA's keeping him on is more of the same Bush politics that he severely chastised McCain for. So much for CHANGE! I've never been so tired of one word in my life, except for the word "racist". That, too, has been way overused! Smart move keeping the defense sec. in place. Obama's cabinet and staff will need someone who knows the situation alttile more. Fresh ideas with the new staff will balance out Gates experience, keeping things new but grounded. Obama is smart by keeping certain elements that are working and Gates has done a good job, kudos Obama. Well I am quite sure Obama advisory people has advised him right. I think Obama wants to be briefed by Gates and see how things are really going before he just make a decision to totally go in a new directions. Obama probably have plans put in force but he wants to cleanup house before he start moving new things in first!! I trust his judgement because he has good experience people surrounding him. He is not arrogant and he will listen. Couldn't say the same for Bush!! I am actually very happy with the move in the sense that it brings stability to the transition process. Keeping Mr. Gates in this position in the short term is not bad, but what I would like to see is a new Undersecretary such as Chuck Hagel have a chance to come in and have a transition "on the job" so to speak. Great choice; obviously Gates and PE Obama have spoken and see many areas of agreement. Gates is an honourable man who doesn't need and wouldn't take the job if he didn't beiieve it would be productive. Smart idea. His fetish for Clinton retreads notwithstanding, Obama is showing a lot of thought in his picks. I think Obama did the right thing. Keep Gates to maintain stability while he concentrates at the biggest problem facing our nation: our economy. Gates was doing a good job, so I don't have any complaints. Good decision. Gates is capable and the right man for the job. He'll be able to effectively propose "real world" solutions to any overly idealistic foreign policy ventures that may be forthcoming from State Dept. or other areas in the administration. We're in the middle of two wars, and it seems prudent to me to get the administration going and getting up to speed before making a change in such a vital position. Kudos to Team Obama. It would be good since he has not been a "yes-man" to Bush. He has fired people over mistakes – major ones. The Air Force heads were fired over nuclear weapons issues. Top Army leaders were also fired over problems in the hospitals. It makes sense to keep him because he can get things done... That and we have two major conflicts going on at the same time. Seems as tho Obama is going right and following Bushes policies more and more each day. The liberal lefties are having fits. He has found reality isn't the same as campaign spin. Secretary Gates – watch your wallet and your integrity! two Border Control Officers that the Feds jailed for doing their job. Of course Gates will remain in place. The "War that will not end in our lifetimes" must go on. Besides, Gates is a "safe pair of hands" for the Project. At the end of the day, it's more about the policy than it is about the person in that role. It's the commander in chief that guides policy. Should we be calling the Obama administration "Bush's Third Term" or "Clinton's Third Term"? Say it ain't so... Gates has got to GO! I trust Obama to choose people he feels are trustworthy. But just as Bush/Cheney were the final word in what happened in their administration, so will that final word be that of Barack Obama!